When you experience a Disney Cruise, you embark on a voyage filled with fantasy, fun and excitement. No matter what your age or vacation style, you'll create long lasting memories aboard the magnificent Disney Magic, Disney Wonder, Disney Dream, and Disney Fantasy cruise ships. The Disney Cruise ships feature spacious staterooms, themed dining, internet access and unique areas of the ship designed for specific age groups to enjoy. For youngsters the children's programs provide activities and facilities with that magical Disney touch. The adult activities include exclusive 18 and older venues, a luxury full service spa and entertainment district. With four ships (and three more on the way), there are a number of cruise choices. The Disney Dream typically sails 3 and 4 night itineraries to the Bahamas, while the Disney Fantasy alternates 7-night sailings to the Eastern and Western Caribbean. The Disney Magic and Disney Wonder travel to unique itineraries, with the Magic sometimes heading to Canada and Europe or the Wonder visiting Alaska and Mexico! Nightly entertainment is hosted in the Walt Disney Theatre. Here you'll enjoy Broadway caliber productions, variety acts, and on some voyages a "Prem-EAR" of a new Disney blockbuster movie. Onboard you'll find a basketball court, shuffleboard, ping pong, shopping, a movie theater, family lounges, adult night spots, and for those of you wish to stay in touch, internet service is offered. Look for deck parties themed to Pirates of the Caribbean or Frozen, and special cruises with days dedicated to Star Wars and Marvel. During the fall, special cruises celebrate Halloween on the High Seas, and at holidays you'll find special Very Merrytime Cruises. 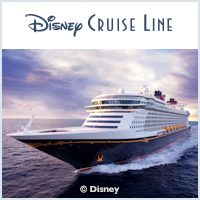 Outstanding service, fabulous dining, beautiful facilities combined with the ever present Disney characters will make this a voyage filled with magic.